They say 7 is the perfect number and for this recipe, it really was! I experimented over the weekend and made 7 different test batches to get a great tasting and perfectly moist spice cake. I really should have named my blog “Satisfying Eats: The Grain-Free Test Kitchen” with all the grain-free and low-carb experimenting I have done over the last 2.5 years. During this time, I have learned SO much, all by trial and error. I intentionally don’t look at other grain-free recipes because I want to make sure I am original. To create a new recipe, I experiment with different ratios (and brands) of flours, liquids, amounts of eggs, different spices and sweeteners. I have been through 100’s of pounds of almond flour (really, I have), dozens and dozens of eggs, almost 200 lbs. of butter and the list goes on and on! I do this so that you don’t have to. Know that when I post a recipe, I have made it NUMEROUS times and if you follow the recipe’s instructions, you should have great success. Don’t worry if you are not a baker or are new to this grain-free lifestyle. I LOVE helping you on your new journey! My goal is to help you create delicious grain-free foods that taste just as good as the “real” thing! Over the past 2.5 years, I have used quiet a few different sweeteners, but about 2 years ago I began using KAL Stevia pretty much exclusively. I chose KAL because it contained no fillers, it was cost effective and it didn’t have a bitter aftertaste compared to other brands of stevia I had tried. I do sometimes however use raw honey or organic coconut sugar to balance out the sweetness in recipes (only if needed). When testing this recipe, I decided to use xylitol. I normally don’t use xylitol but since I know many of you do (and I still had some that I bought from 2 years ago), I decided to use it for one of the test batters. 12-14-14 Update: This recipe works perfectly with my latest stevia find, Stevia Select! Use 1/2 tsp. Stevia Select, 2 tbsp. raw honey and 2 tbsp. unsweetened applesauce. Perfection! Five of the test batches. The first and third row of cupcakes were made using all stevia and were very dry and just didn’t taste good. The second, fourth & fifth row contained either honey or a combination of apples sauce and stevia. This resulted in a much better cake, both flavorful and moist. So after 7 test batches of this spice cake, I have concluded that if using only powdered stevia, it is very hard to achieve a moist end result unless the applesauce was added. The batches that I used xylitol, honey or applesauce in had the perfect texture and did not need the added moisture from the applesauce. Out of 7 test batches, 5 were exactly what i was looking for… Perfectly sweetened cake with the perfect texture! My conclusion: Use whatever sweetener you like but if using KAL Stevia or any other powdered stevia, you will need to add the applesauce to give the cake the extra moisture as well as a small amount of supplemental sweetener of your choice. If using honey or xylitol, extra moisture is not needed. For the final recipe, I decide to use part KAL Stevia, part honey and part unsweetened applesauce to achieve the perfect sweetness and the perfect texture. Feel free to use any of the sweetener combinations from above labeled GOOD! This is the first time that I have tried all of these different sweeteners with the same recipe (7 different times) and compared the results. My intention is not to confuse you but to give you a little background and let you know exactly what sweeteners I used. Honeyville Farm’s Blanched Almond Flour. As mentioned numerous times, I only use blanched almond flour from Honeyville. I know some people make their own almond flour but already ground flour is one luxury that I insist upon having in my kitchen! 🙂 Honeyville’s flour is ground into the finest texture I have tried, and this makes for lighter cakes. However, I know many people that are happy with the results from using almond flour that they grind themselves. You may not realize but the amount of almond flour you measure in a 1 cup measuring cup can vary GREATLY depending on how you measure (and the brand you use). Stir almond flour in the container with measuring cup to aerate the flour and break up any lumps. Use correct dry measuring cup (not liquid) and scoop into container of almond flour, over filling the cup. Using my hand (or butter knife), I run my hand over the full cup to push off any extra flour that doesn’t fit into the cup without packing the almond flour. Using this method give me the same results every time. One cup of blanched Honeyville Almond flour = 3.05 ounces or 86 grams when weighted using this digital scale. Pouring the almond flour into the measuring cup. This will result in LOTS of air and less almond flour than needed. Pack the flour into the measuring cup to see how much will fit. This will result in TOO MUCH almond flour and probably a dry end product. I am not saying that you need to start weighing your flours but if you have been getting inconsistent results, you should give this a try, especially when following my recipes. However, weighing your flours will give you more consistent results. 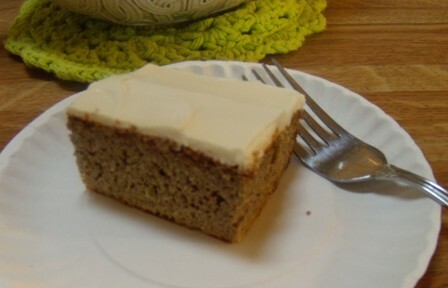 I really love the spice combination in this spice cake. This also was trial and error. Add a little cinnamon, taste. Add a little ginger, taste. Add more cinnamon, taste. Add more nutmeg, taste. I find that I enjoy the batter just as much as the finished cake! I used organic cinnamon and ground ginger but used fresh nutmeg which I HIGHLY recommend using. It’s really cheap and the “nuts” of nutmeg will last a while. If using fresh nutmeg, you will need a microplaner but you will also use this compact grater to zest citrus as well as grating Parmesan cheese. To round out the flavors, I used my homemade double strength vanilla. Good vanilla really brings out the spices in this cake. Looking for a little more texture?? Try sprinkling 1/2 cup chopped pecans or walnuts on top of frosted cake, yum! Dairy-Free Modification: Substitute coconut oil or raw cacao butter instead of the butter. If using coconut oil, the cake will have a slight coconut flavor. Also use canned coconut milk in place of the dairy. This cake is great with or without the frosting so omit it if going dairy-free. Nut-Free Modification: As stated before, recipes calling for almond flour can EASILY be made nut-free by using ground raw (unsalted) sunflower seeds. If using ground seeds, be sure to go by the volume needed vs. using a measuring cup to make sure you use the right amount. Finally, I hope you enjoy this delicious and flavorful cake! To Print, highlight recipe and right-click and select Print. Pour batter into prepared pan and bake for 22-26 minutes or until edges are slightly brown and a toothpick inserted in the center comes out clean. Allow to cool in the pan for 5-10 minutes and then invert onto a cooling rack and remove the parchment paper. Allow to cool completely before frosting. Feel free to leave the cake in the pan to cool (resting on a cooling rack) and frost the cake in the pan. For cupcakes: Makes 12. Bake for about 15 minutes or until toothpick inserted in the center comes out clean. In a medium bowl, blend cream cheese until smooth. Add the remaining ingredients and beat with hand mixer until thick. Taste for sweetness and adjust if needed. Frost cooled cake then cut into squares. Nutrition: 150 Calories, 13 grams of Fat, 5.5 NET Carbs, 4 grams Protein per serving including cream cheese frosting and ingredients as listed in recipe. I’m curious why you only use powdered stevia instead of liquid? Everything I have read says the powder form is a very processed product and not healthy to consume. Just curious about your thoughts on this. Green cut-leaf stevia powder is the only powdered form you should bake with–it’s made by Frontier Spice. No, the green leaves DO NOT make your food green…they dissolve completely into the batter. Alima, no reason. I may try liquid in the future. There are SO many different kinds of stevia and sweeteners it makes my head spin! I’ll keep you posted! Have you tried stevia glycerite? It’s a liquid form of stevia with no bitter aftertaste. It will allow you to cut the carbs even FURTHER because it has absolutely no carbs, no sugar, and doesn’t make your BG climb. I use 3 drops of the stuff in a gallon of iced tea–that’s how potent it is! Your cake recipe may only take about 2 drops. Some people swear by erythritol powder (brand name Swerve), but I can’t use it, as it makes my BG climb (even though it isn’t supposed to). Again–zero carbs, and zero sugar. Ann, I have 7 options for sweeteners and only 1 called for xylitol. Choose your preferred sweetener. For the “master” recipe, I chose to use stevia and honey. I use xylitol exclusively with fantastic results. However, I will have to test without almond flour since I am allergic to almonds. Low carb is something I would love to achieve while baking but with both a soy and almond allergy, I have lost the two lowest carb flours. GF oat flour is next up and I like the taste that it adds and it’s not as dry as rice flour blends. Jennifer, try ground up sunflower seeds in the place of almond flour… for every recipe that I have tried, it worked great. I don’t do any soy but I also use coconut flour, VERY low carb (lots of fiber). Be sure to check out all of my nut-free recipes on the blog! I made this earlier today, and oh my goodness, it is soooo good. The only things I did different were: I used cashew meal from Trader Joes and instead of the coconut sugar variation I used organic cane sugar. I also made a quick cream cheese, maple syrup, and butter frosting. Thank you so much for the recipes. I use many of them, you are awesome. I’m so glad you enjoyed it Kerry! I LOVE spice cakes, and can’t wait to try this one. Could I substitute homemade coconut milk for the heavy whipping cream in the frosting (or skim the cream off the top of my coconut milk and use it)? Unfortunately, I’ve been having stomach issues lately even with raw milk and cream (I’m so bummed…fortunately, the homemade coconut milk is fantastic). Would I use the same measurement, or a little less, since it won’t beat up as thick as heavy whipping cream? Sarah, I love spice cake too! You can either just omit the frosting or use this method to make whipped coconut milk: http://nuttykitchen.com/2010/06/01/coconut-whipped-cream/ Of course, there won’t be any cream cheese (which goes perfect with this cake) but I think you will enjoy it if you accustomed to coconut milk. Let me know what you think! How could I make the pumpkin cupcakes? I was thinking of subbing pumpkin for most of the heavy cream…do you think that would work? Denise, I am not sure. I do have a pumpkin bread in my Satisfying Eats cookbook. If you try it with this recipe, please let me know how it turns out. Thank you for all the effort you put forth developing your recipes! You always have the best grain free recipes. I am looking forward to trying this one next time we have dessert! I finally got around to making this Ginger Spice Cake and, oh my, it it ever delicious! I don’t know what I was waiting for! I made it nut-free, because of nut allergies in our house, by using ground pumpkin seeds, and yes, even though the seeds are green, the final product was not! The cream cheese frosting is spot on in taste and texture. Great recipe!! !